Please feel free to come and go leave a post or two plus any pictures or music you fancy for others to see or listen to..
*Runs and slides into thread* Safe! Sooooo! (looks around) This is your place eh? (picks up a cup cake) hmmm....Looks like you. I like that song. Yep! Welcome friends nice to see you here, please come back when you want to .. They're friendly fluffy food fight fun! They come in many varieties, flavors, shapes, colors, sizes, and even specialties, so there's friendly fun to please everyone. There's little baby ones that go in hot chocolate, (so cute). There's regular size for toasting or making s'mores or just eatin. now you get alot of colors and different holiday themes. Even the name itself ...... 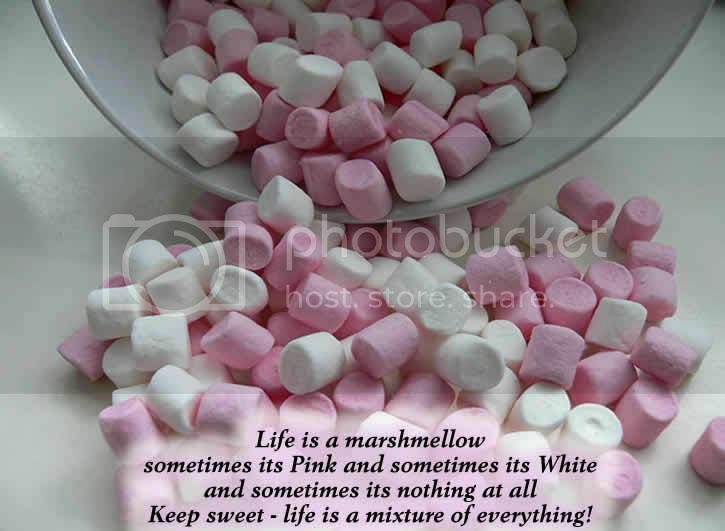 It's hard to call somebody a marshmallow and stay mad at them for very long. And we're all friends here, right? Right lets keep it that way eh..